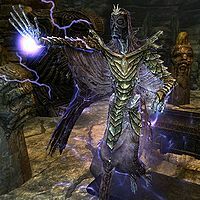 Hevnoraak is one of eight named dragon priests found in Skyrim. He is found in Valthume, and is the subject of the quest Evil in Waiting. His eponymous mask can only be obtained when he is dead. This mask grants immunity to all types of poisons and diseases, except for those which ignore poison and disease resistance. He carries a unique staff that creates a wall of lightning. Hevno means "brutal" in the dragon language.